WARNING: Note that New York City administrative code has an under-4-inch length limit and requires knives be carried concealed. Knife Rights recommends that you never carry your knife clipped to your pocket in New York City. 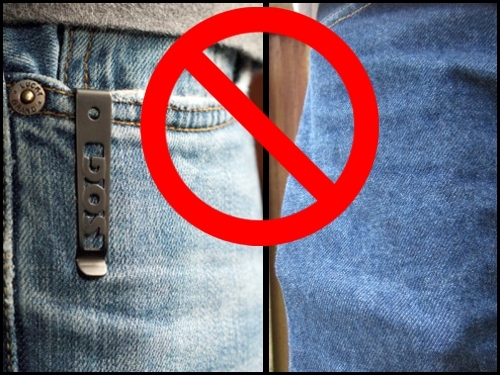 If you plan to carry a folding knife in New York City, we suggest that if it has a pocket clip, you should remove it so you don’t inadvertently clip it to your pocket after use. Even when covered by a jacket, simply moving the jacket aside to get to a wallet has been enough to get folks arrested. Always ensure your knife is completely concealed at all times, including not “printing” on the outside of your clothing. In addition, be extremely circumspect about using a knife for any purpose in a public setting. Note also that NYC has interpreted the state law against gravity knives such that if an officer can “wrist flick” the knife blade open and the knife blade locks open, that knife is an illegal gravity knife. NYC takes this position even if it requires multiple tries and use of exaggerated arm thrust or motion. It does not matter that you cannot “wrist flick” the knife open; if an officer or prosecutor can do so, and they may well be more skilled than you at doing so, you may be arrested. Using this interpretation, most any lockblade knife might be deemed an illegal gravity knife. § 10-133 Possession of knives or instruments. a. Legislative findings. It is hereby declared and found that the possession in public places, streets and parks of the city, of large knives is a menace to the public health, peace, safety and welfare of the people of the city; that the possession in public places, streets and parks of such knives has resulted in the commission of many homicides, robberies, maimings and assaults of and upon the people of the city; that this condition encourages and fosters the commission of crimes, and contributes to juvenile delinquency, youth crime and gangsterism; that unless the possession or carrying in public places, streets and parks of the city of such knives without a lawful purpose is prohibited, there is danger of an increase in crimes of violence and other conditions detrimental to public peace, safety and welfare. It is further declared and found that the wearing or carrying of knives in open view in public places while such knives are not being used for a lawful purpose is unnecessary and threatening to the public and should be prohibited. b. It shall be unlawful for any person to carry on his or her person or have in such person’s possession, in any public place, street, or park any knife which has a blade length of four inches or more. c. It shall be unlawful for any person in a public place, street or park, to wear outside of his or her clothing or carry in open view any knife with an exposed or unexposed blade unless such person is actually using such knife for a lawful purpose as set forth in subdivision d of this section. d. The provisions of subdivisions b and c of this section shall not apply to (1) persons in the military service of the state of New York when duly authorized to carry or display knives pursuant to regulations issued by the chief of staff to the governor; (2) police officers and peace officers as defined in the criminal procedure law; (3) participants in special events when authorized by the police commissioner; (4) persons in the military or other service of the United States, in pursuit of official duty authorized by federal law; (5) emergency medical technicians or voluntary or paid ambulance drivers while engaged in the performance of their duties; or (6) any person displaying or in possession of a knife otherwise in violation of this section when such knife (a) is being used for or transported immediately to or from a place where it is used for hunting, fishing, camping, hiking, picnicking or any employment, trade or occupation customarily requiring the use of such knife; or (b) is displayed or carried by a member of a theatrical group, drill team, military or para-military unit or veterans organization, to, from, or during a meeting, parade or other performance or practice for such event, which customarily requires the carrying of such knife; or (c) is being transported directly to or from a place of purchase, sharpening or repair, packaged in such a manner as not to allow easy access to such knife while it is transported; or (d) is displayed or carried by a duly enrolled member of the Boy or Girl Scouts of America or a similar organization or society and such display or possession is necessary to participate in the activities of such organization or society. e. Violation of this section shall be an offense punishable by a fine of not more than three hundred dollars or by imprisonment not exceeding fifteen days or by both such fine and imprisonment. § 10-134 Prohibition on sale of certain knives. a. Legislative findings. It is hereby declared and found that the possession in public places, streets and parks of the city, of folding knives which lock upon opening, is a menace to the public health, peace, safety and welfare of the people of the city; that the possession in public places, streets and parks of such knives has resulted in the commission of many homicides, robberies, maimings and assaults of and upon the people of the city, that this condition encourages and fosters the commission of crimes, and contributes to juvenile delinquency, youth crime and gangsterism; that if this situation is not addressed, then there is a danger of an increase in crimes of violence, and other conditions detrimental to public peace, safety and welfare. It has been found that folding knives with a blade of four (4) inches or more that locks in an open position are designed and used almost exclusively for the purpose of stabbing or the threat thereof. Therefore for the safety of the city, such weapons should be prohibited from sale within the jurisdiction of the city of New York. b. It shall be unlawful for any person to sell, or offer for sale within the jurisdiction of the city of New York, any folding knife with a blade length of four or more inches which is so constructed that when it is opened it is locked in an open position and cannot be closed without depressing or moving a release mechanism. c. Exempt from this section are importers and exporters or merchants who ship or receive locking folding knives, with a blade length of four or more inches, in bulk, which knives are scheduled to travel or have travelled in the course of international, interstate, or intrastate commerce to a point outside the city. Such bulk shipments shall remain in their original shipping package, unopened, except for inspection and possible subdivision for further movement in interstate or intrastate commerce to a point outside the city. d. Violation of this section shall be an offense punishable by a fine of not more than seven hundred fifty dollars ($750) or by imprisonment not exceeding fifteen days (15) or both such fine and imprisonment. Any person violating this section shall be subject to a civil penalty not to exceed one thousand dollars for each violation.